has released this Notification to fill up total 75 Jobs, so candidates may send Application forms to given address from 28th January, 2017 to 17th February, 2017. Selection Process for these Group C Jobs will be through written test, essential practical test/ physical test/ skill test. Written test is an objective type and will be bilingual i.e. in hindi and english. 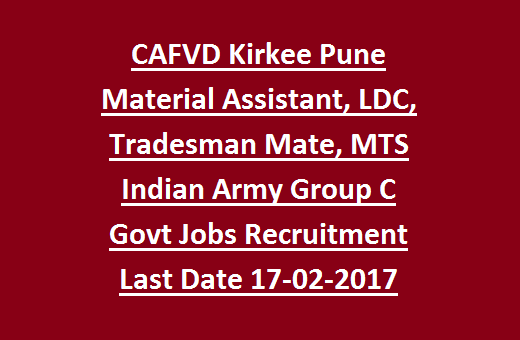 All details of CAFVD Kirkee Pune Recruitment 2017 for Material Assistant, LDC, Tradesman Mate, MTS Indian Army Group C Jobs mentioned below. 1. Submission of Application forms for Indian Army Group C Jobs is 28th January, 2017. 2. Last date for sending completed Application forms to given Address 17th February, 2017. 3. Issue of CAFVD Kirkee Admit Card for Group C Jobs will be notified soon. 4. Tentative Indian Army Written Exam date will be on March or April, 2017. 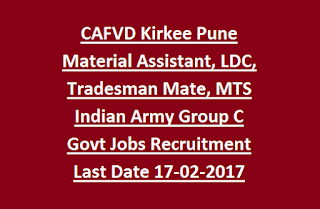 As per CAFVD Kirkee Recruitment, total LDC, Material Assistant, Cook, Tradesman Mate, MTS Group C Jobs are 75. Educational Qualification for Cook, Tradesman Mate, MTS Jobs is matriculation or its equivalent Qualification. For LDC Jobs, 12th class pass from a recognized board with typing speed of 35 wpm in english; 30 wpm in hindi. For Material Assistant Jobs, Educational Qualification for candidates must be graduation in any discipline from a recognized board or diploma in Material management or diploma in engineering in any discipline. 18 years to 27 years for UR category candidates; 18 years to 30 years for Other Backward Classes; 18 years to 32 years for Scheduled caste or Scheduled tribe as on the closing date of receipt of Application forms for LDC, MTS and other Jobs. Rs.5200/- to Rs.20,200/- per month for LDC, MTS and other Jobs. Selection Process for these Group C Jobs will be through written test, essential practical test/ physical test/ skill test. It is an objective type and will be bilingual i.e. in hindi and english. Exam Pattern and Syllabus for Written Test mentioned below. 1.5 km run in 6 minutes; Carrying a 50 kg weight to a distance of 200 metres in 100 seconds. January, 2017 to 17th February, 2017. PIN – 411 003 (Maharashtra).